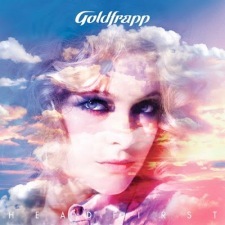 If you’re on the hunt for perfect springtime music, then you could do a lot worse than picking up Goldfrapp’s synth-laden new release, Head First. After the more meditative 2008 LP Seventh Tree, the UK duo have returned with a thinly-veiled penchant for early ’80s melodies torn right out of the Xanadu playbook on their fifth record. 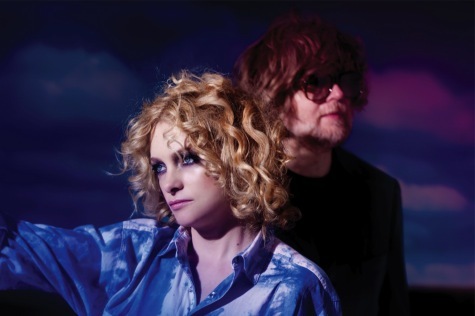 “We definitely did set about making an ‘up’ album,” Alison Goldfrapp admitted to us. And so far it’s resonating—Head First has now been lodged at #4 on iTunes for two days and counting. But while we tried to get the British singer to spill any details on a possible upcoming tour of the States (“I can’t talk about that right now!”), we do at least know she’s headed to Los Angeles to perform at the Hollywood Bowl on June 27 during KCRW’s World Festival (alas, without her seemingly stage-shy musical partner Will Gregory in tow). Hop below to learn about Alison’s rather unglamorous experience making the “Rocket” video, and why it was time for Goldfrapp to dust off the synthesizers once more. IDOLATOR: First of all, I’m really looking forward to catching your Hollywood Bowl performance this June. 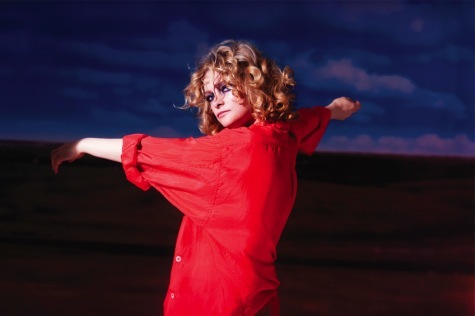 ALISON GOLDFRAPP: Oh, God—I can’t wait. Congratulations on new album Head First. What exactly inspired the upbeat feel of this record? AG: I wanted to do something that was a little bit like Supernature, but that had a warmer sound—maybe not as hard. We wanted to write good, strong melodies. I think it was a reaction to Seventh Tree, as well—we’d done this intimate, dreamy, more introspective album. After Supernature, I was also deeply unhappy with my personal life. I was kind of exhausted from touring, but I had a lot of stuff in me and I wanted to express that. I think every album has been like that—has been sort of like a diary almost. So creatively, there’s always been a reaction to what we do. It was just time to get out the synths again, put your hands in the air. Did the album meet your own personal expectations when all was said and done? AG: Yes. I mean, I love all the songs. It’s short, but we really wanted every song to be there. It’s very concise. I’m very happy with it. It’s the kind of album I can’t wait to play live. “I Wanna Life” should be a single! AG: That’d be great if it was. Do you like “Alive”? That was actually the next one I was going to ask about. Those two—”Alive and “I Wanna Life”—and “Believer” just have single written all over them. Speaking of which, did you set out to make “Believer” sound a bit like Rod Stewart’s “Young Turks”? AG: Oh, wow! Rod Stewart? Yeah, I guess there’s a bit of that era, actually. How did Richard X come to do the “additional production” on “Alive”? AG: He helped with some of the sounds and some of the drum programming. He was someone that we just kind of met and said, “Hey, do you fancy having a go on some of this?” He did, and we didn’t think about it for ages. Then we went back to some of the things that he’d done and we kind of really liked it. But that’s sort of very minimal, to be honest. But, you know, minimal can make a big difference too. He just put a big fat bassline in there, which we really liked, and gave it a kind of sheen that we were into. Did you happen to record any other tracks with Richard that didn’t make it onto Head First. AG: No. Pascal Gabriel also worked on a few songs. AG: We’d actually worked with Pascal a while back. He’s just such a nice guy. We just needed a little help toward the end of the album with some drum programming, so he came in—and he’s just such a nice guy to have around there motivating us. He’s a really lovely guy. He’s so positive and he’s got so much energy. He was really there just going, “C’mon, c’mon!” It’s really nice sometimes to have that objective outside person there motivating you. It can be really healthy. When you’ve been working on something so intensely, sometimes it’s hard to see the wood for the trees. You wrote on the Goldfrapp blog that there wasn’t much of a budget for the “Rocket” video. That said, it turned out pretty well! AG: It’s a funny old world, making videos. Because I think there are so often so many agendas going on. You’ve got the director and their production company, and then yours and then the record company. Usually there are things that get rushed. It’s all a bit crazy. But videos are a necessary tool and a lot of the time it’s just potluck whether they work or not. Where was that video shot? AG: It was actually shot at Pinewood Studios, which you would think would be really glamorous, but it so isn’t! It’s kind of like this old English building left over from when they used to make films way back. They used to do some of the Hammer horror movies there. And of course James Bond… AG: Yeah. The dressing rooms look a little like somebody’s funny dressing room from the 1930s. They’re not glamorous. And they’re freezing cold. It’s quite spooky, actually. Alright, we have to talk about the dreamy album artwork. AG: I think we just wanted something really simple and that had a sort of euphoric-ness to it. A kind of slightly surreal but dreamy quality—pink clouds and [the feeling that] you can carry on forever. A sort of slight fantasy feeling. Switching gears, you also recently wrote that you were distraught over the passing of Alexander McQueen. Were you close with him? AG: No. But it just seemed so bloody tragic. When someone does something like that, you think, “Oh God, if only there had just been a little bit more time.” It just seemed so crazy, with somebody who had so many more years of fantastic things left in them to do. He was an inspiration and a character. It’s just sort of like, why did he have to do that? You sometimes wish people could see themselves the way you see them. But everybody’s got their demons. AG: Everyone’s got their demons, and I guess when you’re grieving that much, all those demons can come back and you feel like you’re out of control. Ha! I was thinking more from the nervous fan perspective, where you always worry when an artist reaches the greatest hits point. “Is this the end of the road?” AG: It’s funny, because we did get asked, and then we didn’t want to do it. It’s a tricky one, because I think quite often bands are contractually obliged to do one, whether they like it or not. I’m not opposed it, but I don’t know when. I don’t want to do one yet. On that note, can’t wait to catch you at the Hollywood Bowl. AG: Cheers!